Research at Sheppard Pratt is spearheaded by distinguished experts within the fields of psychiatry and psychology. Dr. Scott Aaronson is a renowned psychopharmacologist, and leads research initiatives encompassing treatment-resistant depression and other difficult-to-treat mood disorders, Alzheimer’s disease, and tardive dyskinesia. Dr. Scott Aaronson is a thought leader in the areas of biological psychiatry, diagnosis, and the integration of somatic and psychological therapies. He is a clinical associate professor of psychiatry at the University of Maryland School of Medicine, distinguished fellow of the American Psychiatric Association, and is a fellow of the American College of Psychiatrists. Dr. Aaronson also serves on the board of the American Society of Clinical Psychopharmacology and the board of the Clinical TMS Society. He is the chairman of the mentorship committee for the Society of Biological Psychiatry. 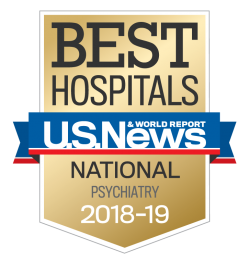 Dr. Aaronson’s areas of expertise include the integration of biological and psychotherapies, complex mood disorders, neurostimulation modalities, and psychoeducation. Dr. Faith Dickerson is a clinical psychologist with public health research training who leads initiatives on schizophrenia and bipolar disorder. Dr. Dickerson’s work focuses on the role of infectious, immune, and microbiome factors in serious mental illness. She also directs clinical and research programs focused on the physical health of individuals with serious mental illness and interventions to reduce premature mortality such as smoking cessation. At Sheppard Pratt, Dr. Dickerson also serves as the Director of Psychology. She is a clinical professor of psychiatry at the University of Maryland School of Medicine and an associate professor of psychiatry and behavioral sciences at the Johns Hopkins School of Medicine. The research has been funded by the Stanley Medical research Institute, NARSAD, and the NIH. She has more than 200 research publications and makes presentations at national and international meetings about her research studies. In her Sheppard Pratt research program, which was initiated in 1999, more than 2,000 persons have been enrolled and more than 10 clinical trials have been completed. She collaborates closely with other research groups, including the Johns Hopkins Stanley Neurovirology Program, and with other groups in the United States and Europe. Dr. Robert Schloesser, a psychiatrist with extensive experience in neuroscience, genetics, and clinical psychiatry, and director of translational research at Sheppard Pratt, is pioneering efforts in the study of neurodevelopmental disorders and bridging new technologies with clinical care. Dr. Schloesser earned his M.D. at the Ludwig-Maximilians-University/Medical School Hannover, and completed his residency at the University of Maryland/Sheppard Pratt residency training program. Dr. Schloesser completed a postdoctoral fellowship at the National Institute of Mental Health’s Laboratory of Molecular Pathophysiology, and has also served as a guest lecturer at the Lieber Institute for Brain Development. In addition to his research and clinical work, he also currently serves as a clinical assistant professor of psychiatry at the University of Maryland School of Medicine. Dr. Schloesser is board certified in general psychiatry.